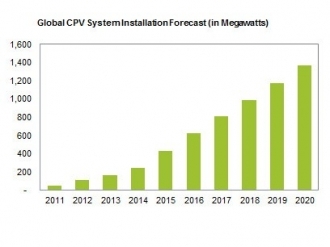 After years of slow progress, the global market for concentrated photovoltaic (CPV) systems is entering a phase of explosive growth, with worldwide installations set to boom by 750 percent from 2013 to the end of 2020. CPV installations are projected to rise to 1,362 megawatts in 2020, up from 160 megawatts in 2013, according to the new report entitled “Concentrated PV (CPV) Report – 2013” from IHS Inc. (NYSE: IHS). Installations will expand at double-digit percentages every year through 2020, as presented in the attached figure. CPV technology employs lenses or mirrors to focus sunlight onto solar cells. But while this allows for more efficient PV energy generation, the use of additional optics for focusing sunlight has also driven up the cost of CPV compared to conventional PV installations, limiting the acceptance of concentrated solar solutions. Nonetheless, the situation is changing rapidly as advancements in CPV technology reduce costs. Prices for CPV are retreating as manufacturing processes progress down the learning curve. Average installed pricing for high-concentration PV (HCPV) systems are estimated to have decreased to $2.62 per watt in 2013, down 25.8 percent from $3.54 per watt in 2012. The decline is being driven by rising volumes and improved system efficiencies. Prices will slide further at an annual compound rate of 15 percent from 2012 to 2017, IHS forecasts, falling to $1.59 by the end of 2017. In the conventional PV market, cost analysis predominantly focuses on the module price-per-watt and the total installed cost-per-watt. When comparing the installed cost-per-watt of conventional PV to CPV, the cost of conventional PV is significantly lower. This is mainly due to the higher panel cost of CPV, given that CPV suppliers have yet to achieve the economies of scale, as well as a better balance of system and installation cost, because of the required tracker system. To be sure, conventional PV has a lower upfront cost and appears to be a more attractive option based on upfront system costs. However, this does not take into account the overall cost of the system over its lifetime, nor does it consider the energy yield of the system. Instead, it is important to compare the levelized cost of electricity (LCOE), IHS believes. The LCOE estimates the cost of generating electricity at the point of connection, dividing the total lifetime system costs by the total energy produced over the system’s lifetime. Such a calculation is also necessary in order to compare the competitiveness of PV and CPV with that of conventional power generation. Using the LCOE, IHS predicts that system costs for HCPV will remain low enough to compete with conventional PV for large commercial, ground-mount systems in target regions. These are the areas with hot, dry climates and high daily irradiation at more than 6.0 kilowatt-hours per square meter of direct normal irradiation (DNI).